One of many dozens of potholes I encountered on the ride. Saint Paul is a beautiful place but like any city fighting its way out of winter’s lassitude, finding its charms is more difficult at this time of year. Winter clings in the form of dirt crusted snow banks, grit lined roads and potholes of assorted size and shape. The obvious signs of spring like greening grass, emerald colored leaves on trees and the rich yellows, scarlets and purples of tulips and irises, remain some weeks out. It is those realities that prompted me to plan today’s ride to the industrial area around Holman Field on the West Side. The early spring dormancy would detract little from light industrial buildings and concrete. The journey began with a cruise down a couple of streets in Highland Park that I’d not ridden. (completing one section of the City will give me a sense of progress.) There wasn’t much to see besides snow, potholes and some stray holiday decorations, but numerous upbeat people emerging from six months of hibernation. There was the usual Saturday flurry of activity along West 7th Street. 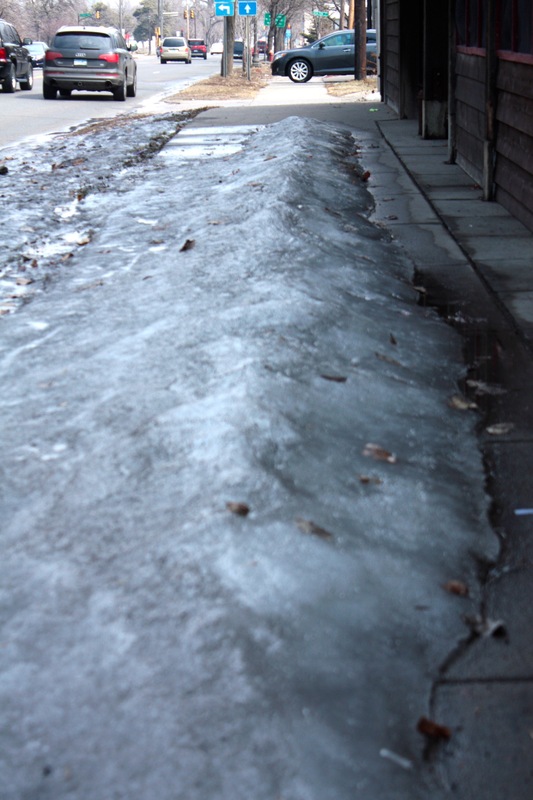 Packed ice is in retreat but still covered most of this section of sidewalk in the 1900 block of West 7th. 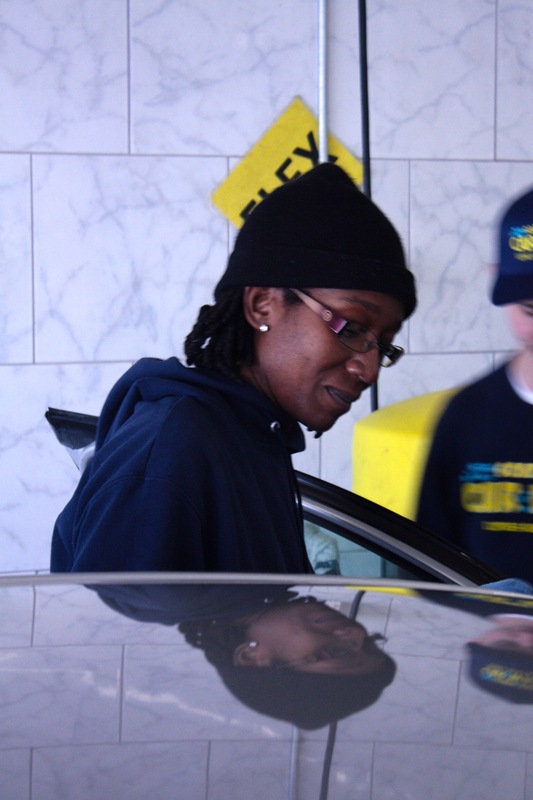 Nice weather brings folks to the car wash. To my surprise, Soapy Joe’s Car Wash had only a short line of cars waiting for a bath. 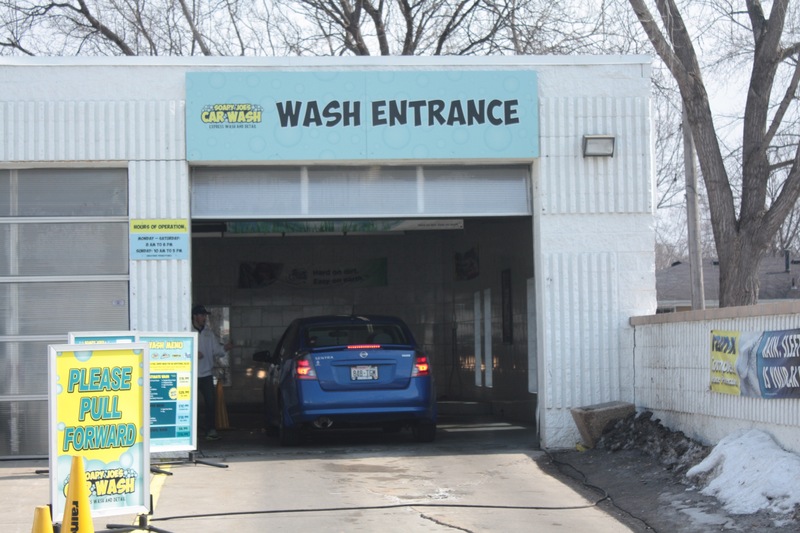 A car enters Soapy Joe’s Car Wash at 1340 West 7th. 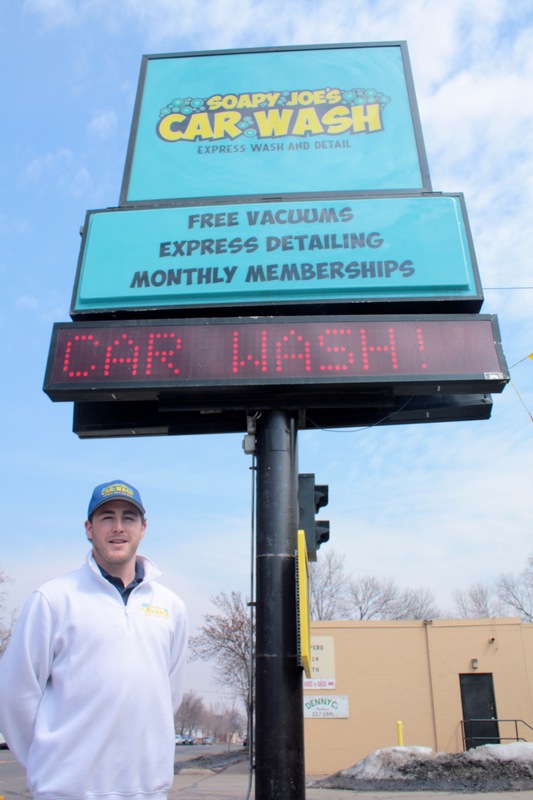 Joe Lindsay in stands under the sign for his car wash. The great weather made fixing one of the vacuums a pleasant task. 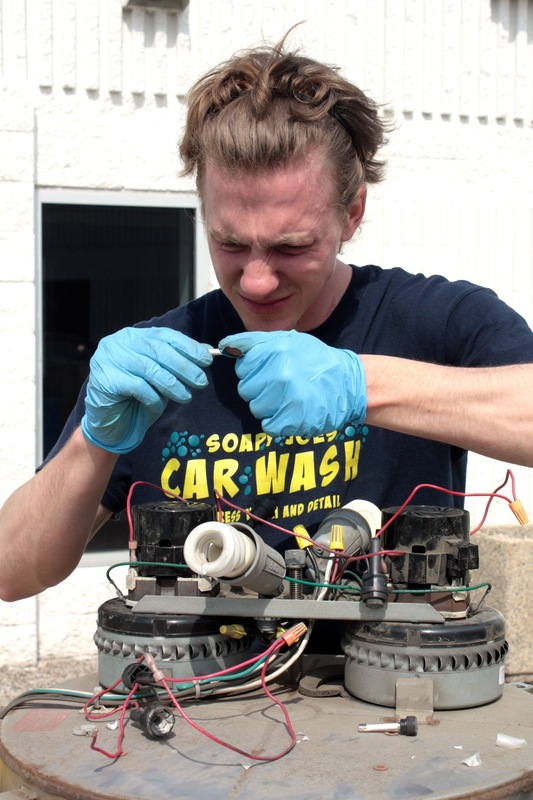 Soapy Joe’s strives to cut water use by recapturing water, processing and reusing it. The grime of winter gets wiped from a car. 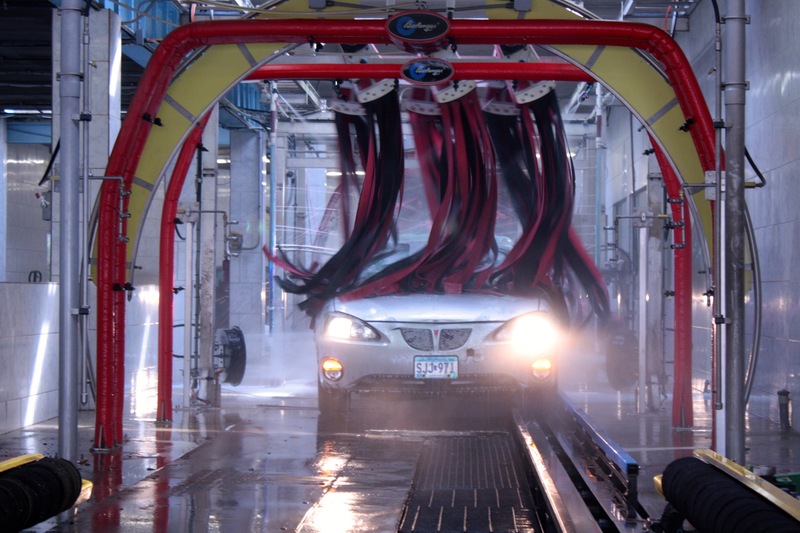 The sheen of a freshly cleaned car reflects two car wash employees. 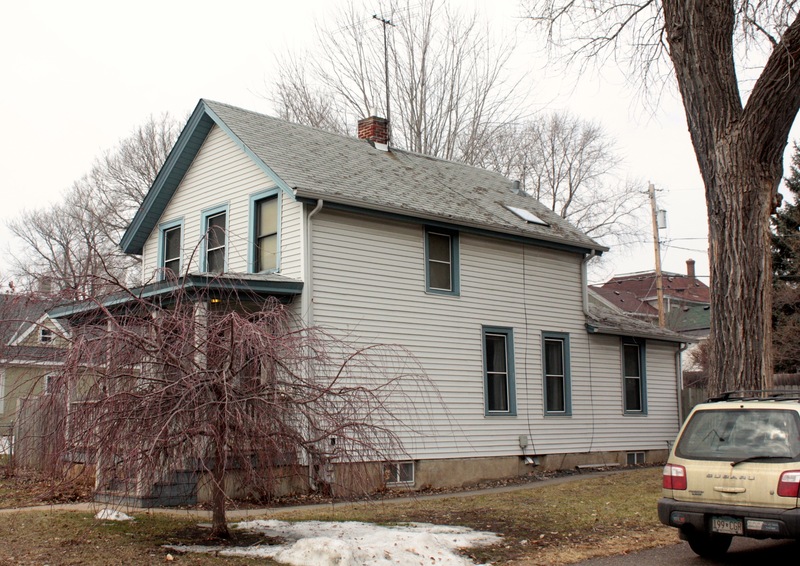 I jumped off West 7th to escape traffic and explore the nearby residential neighborhoods. I rode upon streets with women’s names like Ann, Emma and Grace (which actually isn’t having been named after Bishop Thomas Grace in 1872.) About a block away, on Banfil Street, is a uniquely renovated building that is home to an advertising agency. The eclectic look of 159 Banfil Street befits the headquarters of an ad agency. 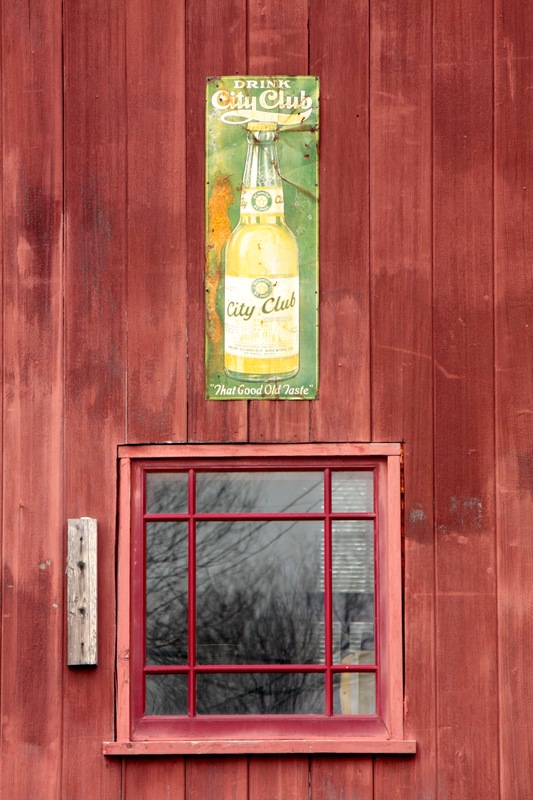 A second story window and an old City Club Beer sign above it at 159 Banfil. 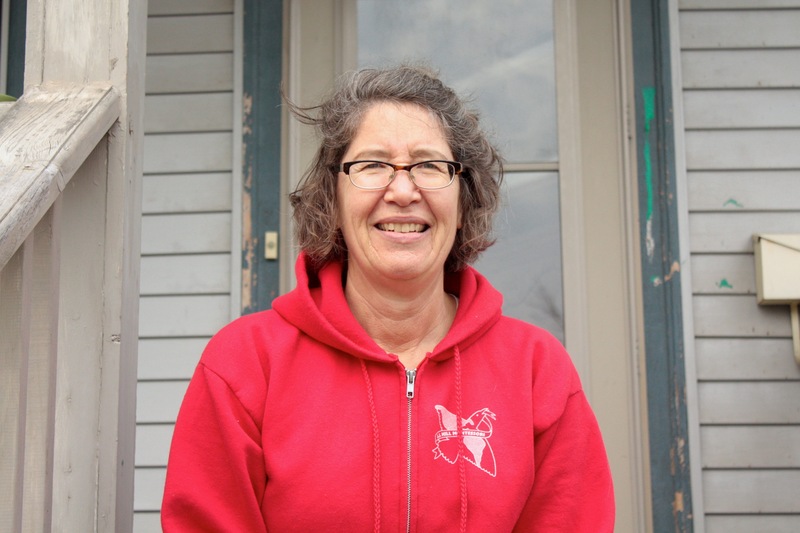 Julia Reimer sits on her front steps at 261 Banfil Street. 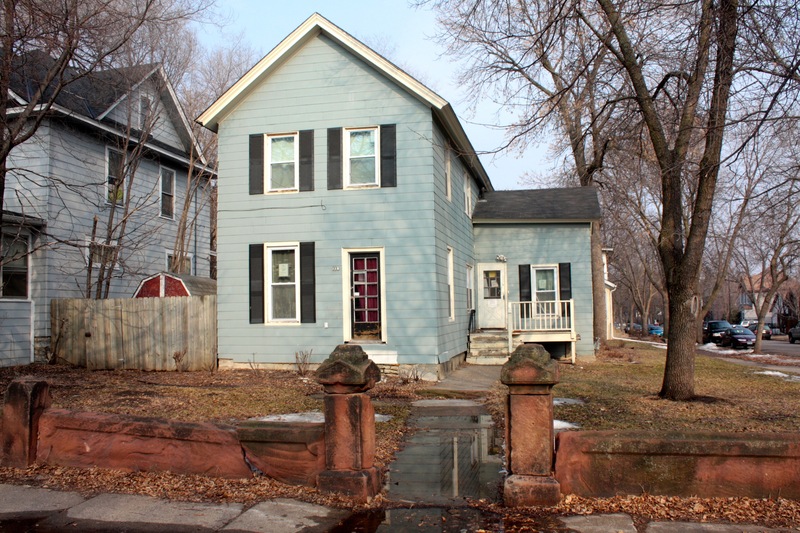 Julia also told me about the neighborhood garden on Dousman and West 7th and a puppet theater that performs in the summer in what is known as the driveway tour or garage tour. 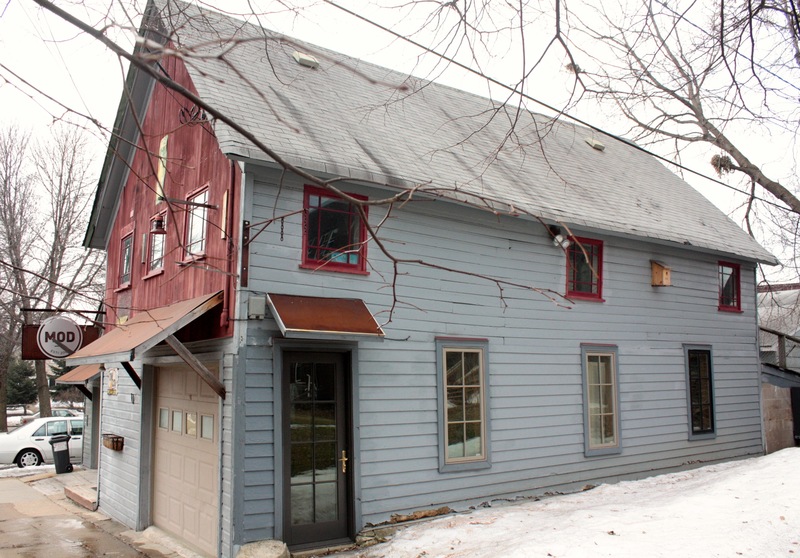 Julia Reimer’s home, 261 Banfil. Moving on from Banfil Street, I cruised several other side streets, then on to West 7th. I didn’t know it then but the planned Holman Field trip was about to get canceled. On 7th, just east of Forbes Avenue, a van with two women and five children inside sat in the parking lane with a flat tire. I stopped and offered to change the flat. I don’t change tires like a NASCAR pit crew, but I’ve changed enough tires to be confident in my skills. Stephanie and her family piled out of the car and onto the sidewalk and I began lowering the spare tire stored underneath the back of vehicle. For some reason the cable and bracket holding the spare descended but the spare tire didn’t. ‘I’ll come back to it,’ I thought, ‘I’ll remove the lug nuts from the flat tire first.’ The first four came off as they should but the last one wouldn’t budge. Try as I might, I succeeded only in stripping the lug nut. 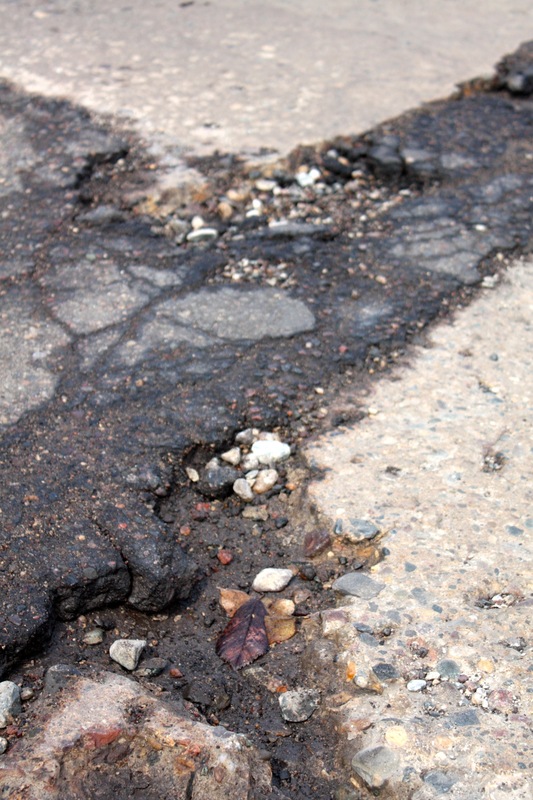 Time for a call to AAA Roadside Assistance for help. As I worked on the tire, Stephanie called her husband for help. Rockett arrived soon after with a four-way lug wrench that fit better than the multipurpose wrench/jack handle that came with the van. A few turns and the lug nut came off, so I canceled AAA. 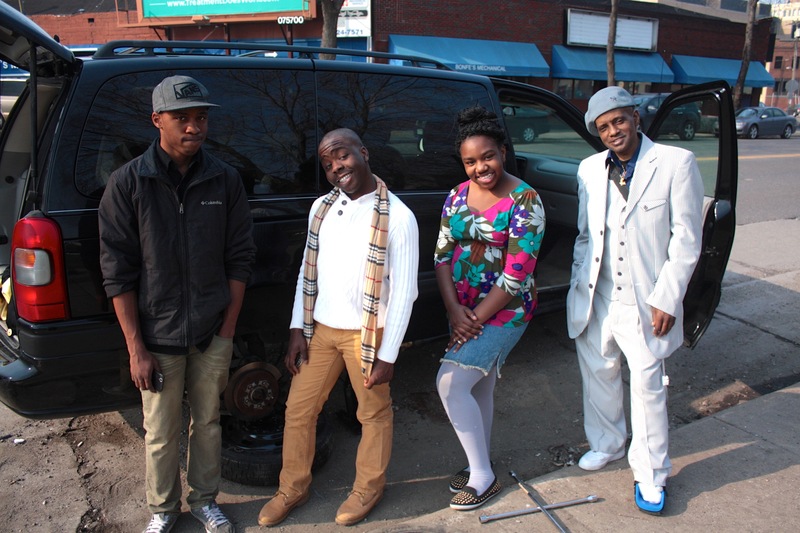 Rockett and some of the crew pose in front of their Chevy van. Back to getting the spare to drop from the undercarriage. Despite multiple readings of the car’s manual, Rockett, his son Jeremiah and I still couldn’t get the tire to release. (This may be one reason GM no longer makes minivans.) I made a second call to AAA. Rockett grabbed the spare from his Mercury hoping it would fit the Chevy, but no such luck. As this man-against-machine battle played out, Stephanie left with the younger children and took the flat to a tire store in Rockett’s car to buy a replacement. After two and a half hours and the van finally ready for the new tire, Rockett suggested I take off and thanked me for my help. There wasn’t time to get to the Holman Field area so I visited a few more West End roads, including Douglas Street. Built in 1880, 118 Douglas Street is fronted by a well-worn sandstone wall. The address is faded but still legible more than 130 years after being built! 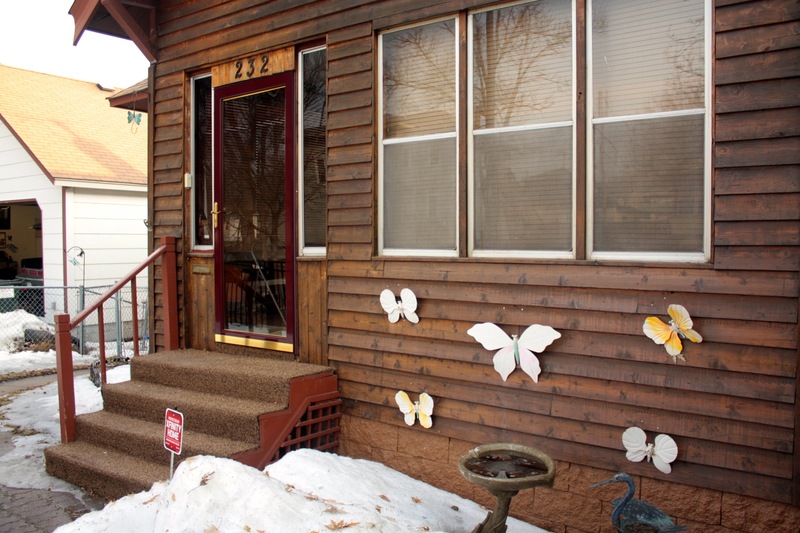 Giant butterflies rest on the front of 232 Goodrich Avenue. Some interesting notes from Don Empson’s “The Street Where You Live” on a couple of the West End streets I traveled. 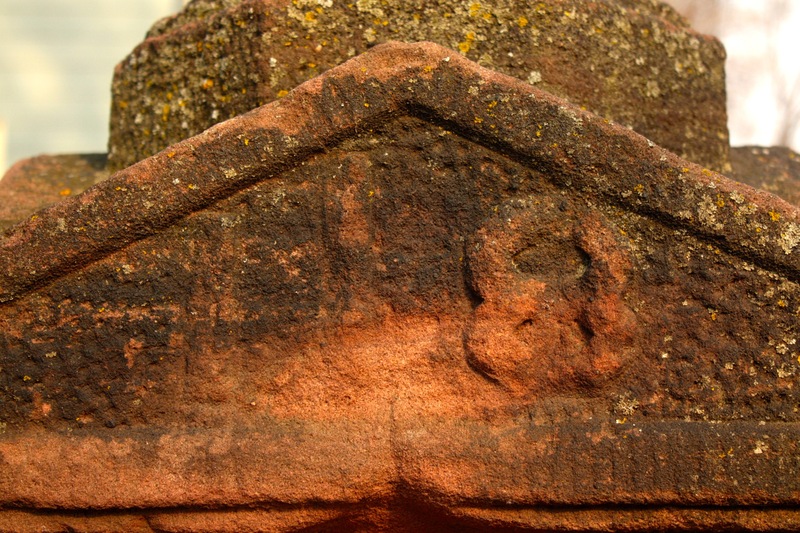 Dousman Street was named for Hercules Dousman of Prairie du Chien, WI who is recognized as the first person to suggest the name ‘Minnesota’ for the territory. Douglas Street, named in 1851 for U.S. senator Stephen A. Douglas of Illinois, who ran unsuccessfully for president against Abraham Lincoln in 1860. It felt great to be back on my bike. It was a nice first ride of 2014, even though it didn’t follow my plan. A March ride is a huge win, especially since the weather last year didn’t allow me to get out until May. Click the link below to see the map of today’s ride. I love reading your work. This is such a unique neighborhood and you bring out the reasons why our neighborhoods mean so much to us. 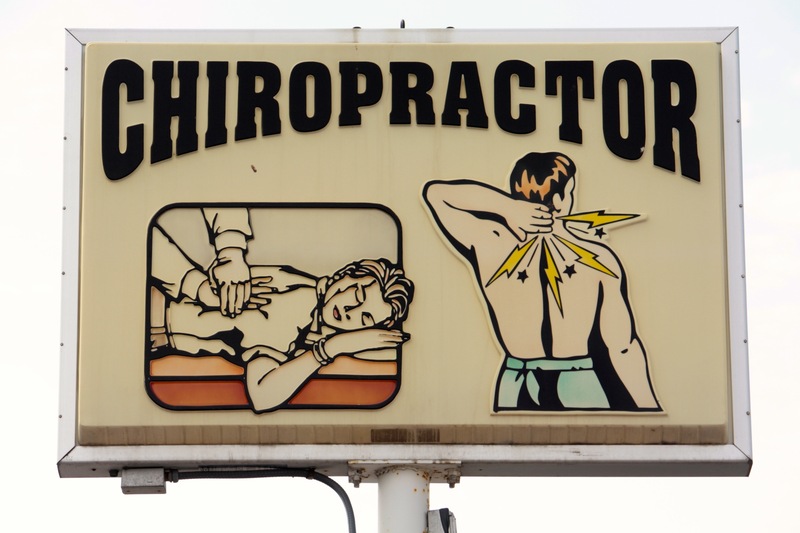 PS I am half in love with that W 7th chiropractor sign as well. I agree with Bill. I really loved reading this piece about people living in a locale with a strong sense of place and neighborliness. Thanks for this intimate look at city life from a Greater Minnesotan who doesn’t venture into the Cities all that often. So the West End does include the area south of the bridge with Randolph where those dive bars are, right? Still have yet to check out Skinner’s and I have to say the neighborhoods are totally different on either side of the railroad tracks/Grace St. I’m surprised there’s not a sub-neighborhood name for each.